1). “A Tribute to Bob Browning”. Part 1. First half of the Bob Browning Tribute featuring the first 4 films and all of the chat. 2). “A Tribute to Bob Browning”. Part 2. Second half of the Bob Browing Tribute freaturing the last set of films and all of the chat. 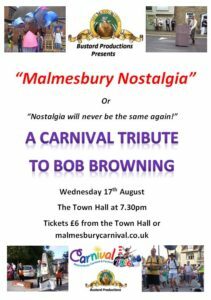 Malmesbury Nostalgia / Bustard productions were back for the 2016 Malmesbury Carnival with a special “one off” tribute to the late Bob Browning on Wednesday 17th August in the Town Hall. 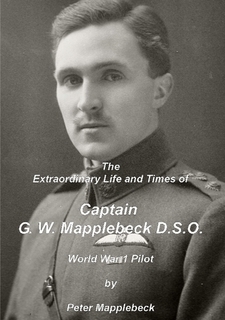 Bob’s impact upon the town of Malmesbury was immense so this special evening will concentrate on his Carnival related work and also the archive work that we managed during our time as “Bustard Productions”. Fellow Bustards Andy Solomon, Clive King and Gordon Williams were in attendance as will fledgling Bustards Dave Witt and Charles Vernon. Bob’s talks at carnival were very much a highlight and were always sell outs (one year we had to do two nights, one in the town hall and one in St Mary’s and both sold out). I joined him some years ago when his Powerpoint presentations were reaching epic proportions and his computer simply could not cope. We worked together for several years, him presenting and Andy Solomon and me keeping the technical side afloat) before we began to present joint evenings – I covered the first half before Bob took centre stage with the second half. The idea behind Bustard Productions came about after a particularly convivial evening at my house involving Bob, me, a collection of old videos and a pile of 35mm slides … oh, and a bottle of whisky. We’d advertised in the Carnival programme as “Bob Browning and the bearded wonder” but I’d shaved my beard off – recipe for confusion. We decided we couldn’t call ourselves “Malmesbury Nostalgia” because that was the name of the event we hosted each year and because quite a bit of our work was now to do with matters outside of the town of Malmesbury. As the evening wore on and the level of whisky in the bottle plunged, so our deliberations became more creative and less sensible. In the end we decided to call ourselves after “Wiltshire’s bird”, the Bustard, a model of which Bob had paraded through town at a previous carnival procession. As Bob wended his unsteady way home I took to the computer, recalled the MGM logo and photoshopped out the lion and replaced it with a Bustard – and so Bustard Productions came into being. I had forgotten quite how much material we had gathered between the two of us and so sorting out material for the Carnival Tribute has been quite challenging. A model of an elephant, built by Bob and some of the Malmesbury Raleigh Group to India in 2011, is still resplendent, hanging from the roof in my garage. We spruced the old girl up and paraded her in last year’s procession as a mark of our respect for Bob and all that he did for carnival and the town. 1st half: 4 short films about Bob with carnival anecdotes between each one. a). Bob and the Carnival Procession. b). The Driftwood Master. c). The collector (with some television footage not seen since 2000) and d). and interview with Bob by Steve Cox in 2013. 2nd half: a). a new re-working of the Betjeman Malmesbury project. b). a chance to see some parts of the wonderful Cowbridge House film that Bob made with Fred Goudie. c). 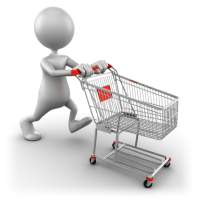 Bob in concert – a short film showing some of his wonderful observational skills as he presented his slides. A 2 DVD set covering all of the films and the spoken tributes is available on request (see address below). 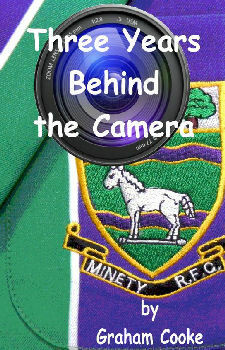 We are still on the look out for any photographs / film of Bob in action. If you have any that you’d like to share with us please email me (address at the bottom of this page) with a copy.